At the 2012 Tour de Quebec, a 5-day elite cycling stage race held in beautiful Quebec City, Canada this July, two client-athletes from Finish Fast Cycling were there competing for different teams. The two athletes, who we will call Archibald and Vladimir, are two completely different types of riders. Both riders are from New England and are in their mid-20s. Archibald, a Category 1 rider, is relatively new to cycling and a is powerhouse with immense strength who can also hold his ground on climbs. Vladimir, also a Cat 1 but with a few more years’ experience, is more of a wily rider who excels at all types of racing, and is one of those guys that can just appear at any spot in the race field at any time. The first thing one notices when first looking at these power files are the number of high-value power spikes from Archibald (red) in the beginning and middle of the race. His normalized power was 337w (IF=1.2) with the high spike being 1285w early in the event. Vladimir (yellow) on the other hand, normalized at 310w (IF=1.27) with a spike of 1222 watts leading into the finale and then again at the sprint itself. You can also see how Archibald’s heart rate is a little lower than Vladimir’s; which can be attributed to both Vladimir’s smaller size as well as Archibald’s higher fitness due to a strong racing schedule. However, the trick to doing well in a race is being able to produce those high sprint spikes late in the race when it matters. How Vladimir was able to do so can be seen at the bottom of the chart, where it compares pedal cadence. Archibald was pedaling the entire time, whereas Vladimir stopped pedaling very often and coasted over and over again. Every time he does that, he is saving energy which can be applied later on. If we look at the journal page of the power file, we see that Vladimir coasted his bike 11.6% of the race, for over 19 minutes! Comparatively, Archibald only coasted 1.5% for just 2 minutes. That’s a big difference. Obviously, if you have the chance to pedal 17 minutes less than the guy next to you during the same race, you’re going to feel better at the end of it. With very similar Intensity Factors (the ratio of normalized power to FTP) we know the athletes put out the same amount of overall watts, but with almost 300 kj difference in energy burn for the same event, Vladimir was able to have what was needed at the end. It is absolutely critical to remember that it doesn’t matter who works the hardest during a race, but who does the best at the end. And in cycling, conserving energy is the key to having more of it at the finish, when it counts. The less you pedal, the less energy you use. Simple. So, how does one develop the power to perform at a high level, but still save energy by minimizing pedaling at the same time? Now, the folks at TrainingPeaks keep telling me that the key to a successful blog article is to also include sample workouts that relate to the theme of the article. Hopefully, you will all see the workout and then want to hire me to be your coach. Some just might call the police. Anyway, assuming one has a solid aerobic base and is feeling fresh and healthy, the best workout I like to prescribe for this scenario is one called “Head Case Intervals”. I have found this is done best indoors on a trainer, or maybe on a closed loop like a park or even a parking lot. After a good easy warm up of 15-20 minutes, shift into a medium gear that will stress the legs without ripping your joints apart. Then, while seated, sprint hard to a maximum effort for 15 seconds and then stop pedaling completely for 15 seconds. Repeat again. And again. Repeat until you can no longer accelerate to the maximum level. Whew! Then, recover easy spinning for the same duration of the total effort (for example, if your 15-on-15-off efforts lasted 20 minutes total, recover spinning easy for 20 minutes). The first noticeable effect will be a quick and steady increase in heart rate, but less obvious will be the training effect this workout has on your short-term energy source, as well as long duration VO2 Max. We have seen higher CP-6 values from this workout than at NRC road races! Performing this workout once a week for the few weeks building into a big race, you will see your body and system adapt to handle the repeated re-accelerations that occur at a hard criterium. Plus, your efficiency in those re-accelerations will improve so that you race better. 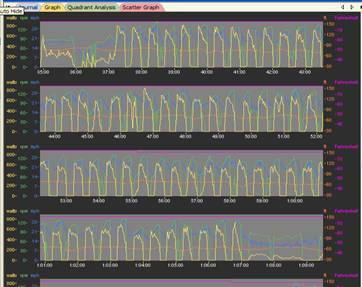 You can easily see how the Head Case Interval workout compares to Vladimir’s criterium power file. The hammering you give yourself in this workout really increases your pedal start power, which means you can keep coming out of corners or moving around the field during a race while spending less energy. So, when it comes to race day, the event itself will seem easy compared to the thrashing you see above. Train hard and race easy. I will also give you a top secret insight to the upcoming fall sport of cyclocross: this is a perfect workout for that too! A review of power files from any level of cyclocross race shows a constant ebb and flow of super high efforts followed by coasting. Just imagine every grass corner sprinted out of, every hurdle leapt and every slow rider passed. Hit the gas, coast to a safe speed, gas, coast. Hopefully I will be back soon to break down what happens during one of those races too! 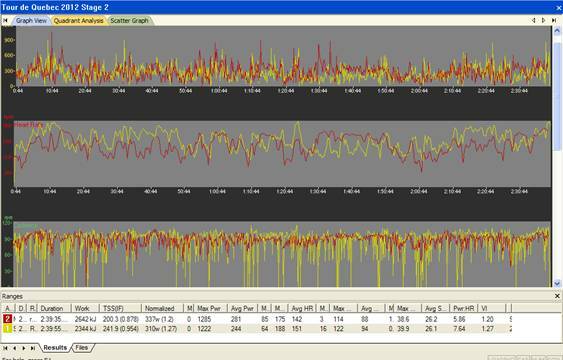 Want to see the same type of analysis for your own power data? Download a 14 day trial of TrainingPeaks WKO+.